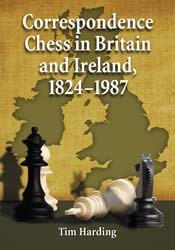 My book, Correspondence Chess in Britain and Ireland, 1824-1987, was one of four titles shortlisted for the 2011 English Chess Federation Book of the Year award (but did not win). It is published by McFarland, the US-based leading publisher of chess histories and biographies. The book is available through normal chess booksellers, Amazon etc. but NOT from this website. The book is a large softback (439 pages, 7x10 inch page format) at $49.95. The ISBN (for orders through bookshops) is 978-0-7864-4553-0. Award citation and extracts from reviews of the book. Partly based on sections of my doctoral thesis, together with additional research, the book presents a detailed picture of the development of postal chess from the earliest days to the eve of the computer era. While focusing on Britain and Ireland, it also includes information on early correspondence chess in other countries and the growth of international CC. It includes about 200 games, annotated in varying degrees of detail, and 53 pictorial illustrations. PLUS notes, appendices, index of opponents, index of openings, index of illustrations, general index.